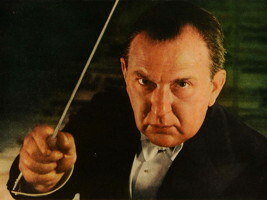 Its well documented that Fritz Reiner, one of the most well known conductors of American classical music led ensembles with a baton that barely moved. In Conservatory, many of us shared an apocryphal story about how he once fired a musician for bringing binoculars in a rehearsal when to help “find” the beat. reign of Reiner as conductor. Reiner stopped a rehearsal one day when he noticed a bass player looking at hlm through binoculars. “What, are you doing?” growled. Here‘s the original article. Looks like this one’s true after all!